Table 6-3 lists the most critical DTCs for this system. PID (parameter identifier) is a two- or three-digit SAE numerical code assigned to each component. For example, 91 refers to the throttle position sensor. FMI is a failure mode identifier used to describe the kind of failure detected, and flash refers to the number of blinks the code triggers on the “check engine” lamp. 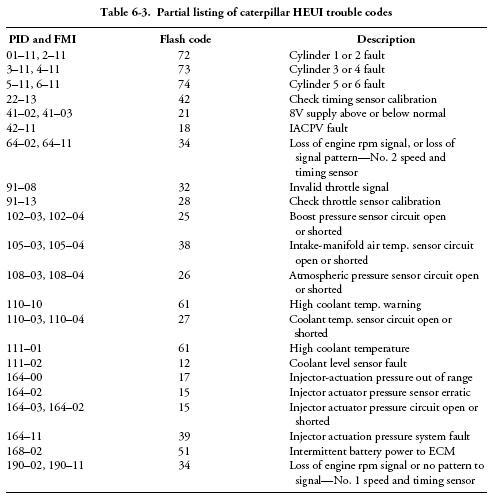 Some codes are merely informational and do not affect engine performance. Active codes, that is, those that turn on the diagnostic lamp and keep it on, mean that the problem requires immediate attention. The lamp will go out when the malfunction is repaired. Intermittent malfunctions, often caused by loose harness connectors or bad grounds, cause the lamp to blink and go out. These codes are then logged in computer memory, where they can be retrieved and erased with the appropriate scanner. Intermittent codes that are logged repeatedly need investigation. Subscribe to comments with RSS or TrackBack to 'Caterpillar EMS HEUI Trouble Codes'.